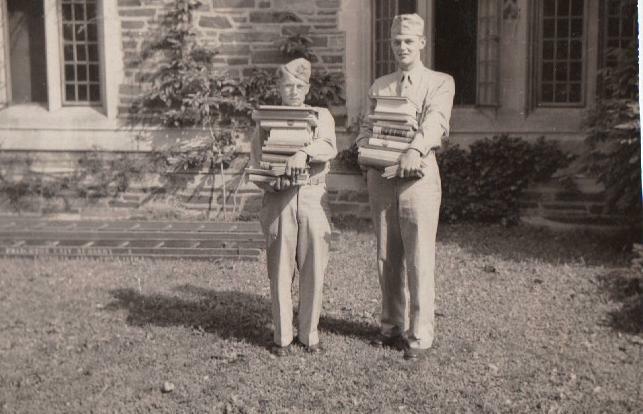 The thing I was looking forward to the most when I saw the itinerary for our trip to Philadelphia was the opportunity to see Princeton because my Grandfather had the opportunity to study there during World War II. As we got closer to the date I received some pictures of my Grandfather as a student and some pictures of my grandfather from my grandmother. Leading up to the trip my father decided to sell his house and began a grueling process of getting rid of a life to me of “junk” and personal treasures. He gave me some items from my Grandfather and other personal items that I don’t know what to do with, but I treasure the items because they connect me with the men in my life that I have loved, appreciated, and learned so much from. I have been blessed to have great male role models in my life that I was to emulate and make proud. As we walked around Philadelphia on Saturday we had a chance to walk in our Founding Father’s footsteps and see and touch items that the Founding Fathers saw and touched. At the Philadelphia Philosophical we got to see some rare treasures like William Penn’s charter for Pennsylvania, a copy of an early draft of the Declaration, and some of the journals of Lewis and Clark. As a group we were all giddy over these rare treasures. We also got to hold an old, but not extremely rare copy of Thomas Paine’s “common sense”. It was fun seeing the teachers wanting our pictures with the copy and seeing our excitement for rare treasures. We also got to see Independence Hall, The Betsy Ross House, the Liberty Bell, a Quaker Meeting House, and Christ Church. On Monday we traveled to Valley Forge and saw George Washington’s House where we were told the banister was the original used by George Washington in 1778. It was hilarious to see teachers lining up to get there picture with the banister. Jess even hooked her leg around it (picture). In each place we relished the opportunity touch and sit in the places where our forefathers sat because in a small way we feel connected to them. Why do we feel comfort and pleasure in seeing these places and objects? What is it about the Founding Fathers that we feel we need to have a connection to them? Why do we revel in their presence? Why is it that cable news commentators will still turn to the Founding Fathers and speculate about what they might have thought about our current events? Do the British ask about what Queen Elizabeth or Henry VIII might handle current economic concerns in Britain? After addressing these questions to Dr. Harris he believes that because of the age of our Constitution and its success that that lasted through a civil war, great depression, and two world wars. But is it more than that? Is it our fascination with the famous? Is it a spiritual reverence for America’s collection of demigods? What makes us so giddy over this connection? Thinking back to my family and my recent acquisitions from my father and grandfather, I know those objects that have connected me with men in my life who I share a history, whom I have learned from, and whose lives have given me hope, guidance, and love. As we drove into Princeton on a rainy day (my favorite weather) I couldn’t wait to jump out of the bus with my loving friends and find the spot where my grandfather once stood. Luckily we found the spot I got the opportunity to take some pictures where my Grandfather once stood during WWII. My only regret was actually not just staying there a little longer. I loved and respected my grandfather so very much being able to find that spot at Princeton and walk in his footsteps meant a lot to me. I want him to know how much I loved him and hope that my life would make him proud. I want him to know how much he meant to me and how he has shaped my life. Perhaps in some way we do that today with our Founding Fathers as well. We want them to know how much they mean to us and hope that they too would be proud of this country that they shaped. Classroom Connection Ideas: Have students bring in an item from their house that is special to them because of its family history and have them write about its significance and why they are so connected to it. Write a blog about a place they would like to visit because of their personal histoical connection to it.